Since 2011, i2P2M is offereing the Executive Diploma in Project Management (EDPM) and the International Executive Diploma in Project Management (IEDPM) in association with The George Washinton Unviversity School of Business, Washington D.C., USA. The Executive Diploma in Project Management (EDPM) is for 12 days spread over 4 months and is offered independently in two cities in India - New Delhi and Mumbai. EDPM has 4 Modules and the classes are held in India only. Each Module is for 3 days and is held on Friday-Saturday-Sunday. The International Executive Diploma in Project Management (IEDPM) covers an additional 1 week study tour in USA. The IEDPM program is for 17 days spread over 5 months and the classes are held in India + in USA at the George Washington University, Washington D.C., USA. Module 1 to Module 4 are same for both EDPM and IEDPM. Module 5 held in USA is only for IEDPM participants. At the end of each Module participants are required to write a report outlining their learnings from the module as well some aspects they will include in their worlplace based on the inputs. the future to manage changes pro-actively. We must take decisions consciously considering uncertainties. The challenge in managing projects lies in accelerating the 'rate of reduction of uncertainties'. new concepts and best practices in the knowledge domain on average goes up by a factor of 2.7 times. Totality of Project Management covers eight Project Life Cycle (PLC) phases with 36 Knowledge Areas and 117 key Concepts. 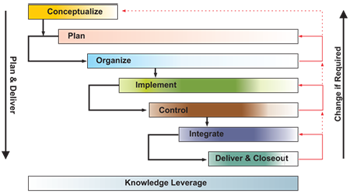 There are eight Project Life Cycle (PLC) phases – Conceptualize, Plan, Organize, Implement, Control, Integrate, Deliver and Closeout and Knowledge Leverage. Each phase has been depicted using different colors of varying intensity showing the intensity of the work during that phase. Some of the 36 Knowledge Areas covered are: Stakeholder Management, Need Analysis, Business Case, Success Criteria, Scope Definition, Time Management, Cost & Finance, Project Management Plan, Roles & Responsibilities, Risk & Opportunity, Procurement, Quality, Information Management & Reporting, Contract Administration, Communication, Organization Structures, Leadership, Motivation, Conflict Resolution, Team Performance, Negotiation, Change Management, Issue Management, Problem Solving, Internal & External Interfaces, Health, Safety and Environment, Closeout, Post Project Evaluation, CSR, Agile methodology etc. In the three days, the participants will be able to better appreciate the nuances of managing projects and programs. Before starting this module, to assess the current knowledge level of the participants, their PM knowledge is assessed on a scale of 1 to 10 through a brief pre-Project Management Knowledge Quotient (PMKQ™) assessment test. At the end of the 3 days, a post PMKQ™ assessment is again taken by mapping the scores obtained in the CIPM examination in areas that were covered by the PMKQ™ questions. At the end of this Module (PM1), the participants will be given a comprehensive 2.5 hour examination which leads to the Certificate in Project Management (CIPM) credential. 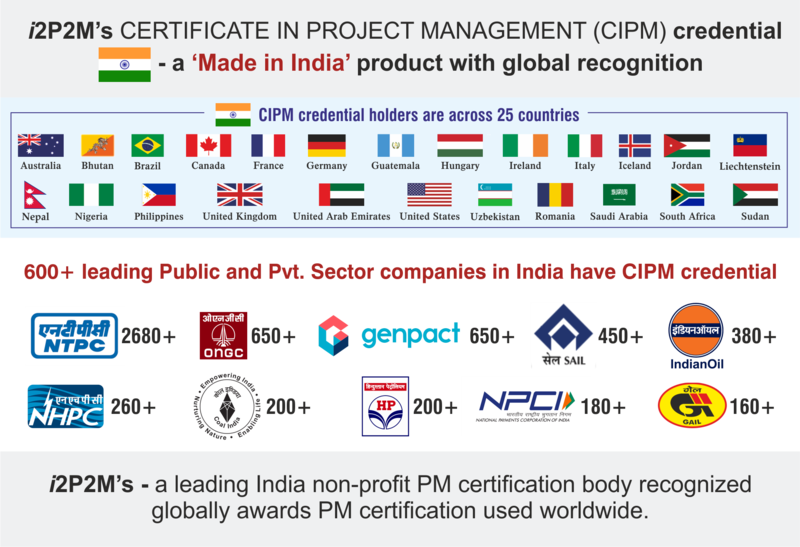 This certificate is administered and awarded by the International Institute of Projects and Program Management (i2P2M). then compare this with their performance in the 2.5 hour CIPM certicate exam after 3 days of extensive training on Totality of Project Management which extensively covers all areas of project management. The improvement seen is phenomenal - on average the knowledge domain of all participants has gone up by a factor of 2.6 times. This is based on participants of class 2016 and 2017. 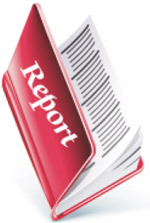 Report on Module 1 - Is must and should be written by participants suggesting changes in their own work environment in view of inputs gained in the Totality of Project Management module.. The target date for submitting the above report is 14th July 2019 for New Delhi participants, 21st July 2019 for Mumbai participants. and 24th July 2019 for Bengaluru participants. Module 2: Computer Based Real Time Project Simulation and Experience Sharing from the leding Prendo Simulations, U.K on first 2 days (PM2A) and Experience Sharing on 3rd day (PM2B). Is Director of Prendo Simulations Ltd: With a specialism in simulating the challenges of leadingcomplex projects, Prendo's simulations are used at many of the world's top business schools, including: Columbia, IMD, INSEAD, MIT Sloan, Oxford/Saïd and Wharton. Guy has delivered hundreds of simulation workshops in over 30 countries around the world, with organizations including: Bechtel, EDF Energy, Gazprom, Goldman Sachs, IBM, Morgan Stanley, Oracle, Petrobras, Shell and the United Nations. He teaches on various MBA, EMBA and executive programs at Cambridge, Columbia, MIT Sloan, etc. Prendo was commissioned by Shell to design and develop a simulation of how typical spectrum of stakeholders behave during a major project. The simulation brings to life the a universal leadership challenge of maximizing support across a range of parties who have different interests, agendas and motives. Prendo's Project Leadership simulation gives participants an intense experience of managing a complex project from planning through to operation. Teams make a series of judgments about: the contract and procurement strategy, defining the scope and changes, clarifying the project objectives, risk and stakeholder management, scheduling and resourcing. Crucially, the simulation brings to life the importance of integrating all the relevant disciplines. We invite leaders from industry to share their success stories in implementing their projects with excellence. Based on the extensive discussions with business leaders through the day, participants get an opportunity to relate their learning with practical examples as told by the business leaders. The uniqueness of this Experience Sharing Session is open dialogue between a resource person and the participants. Report on Module 2 - PMR2: Is must and should be written by participants suggesting changes in their own work environment in managing stake holders, Project Leadership and based on their interaction in experience sharing session. Target date for submitting the above report is 9th August 2019 for New Delhi participants, 16th August 2019 for Mumbai participants and 23th August 2019 for Bengaluru participants..
Adesh Jain, Chairman, i2P2M holds a B.E. in Electrical Engineering from the Indian Institute of Science, Bangalore and Masters of Engineering from Canada. In 1978, at the age of 33 years, was heading one of the divisions of BHEL. In 2005, he became the only non-European President of IPMA which comprises of 67 Member Associations from all the continents. In 2006, Became the Honorary Chairman of China Construction Project Management Committee (CPMC). He was invited twice in 2010 and 2012 to give presentations at the NASA - PM Challenge conference. Was an Independent Director of NTPC Ltd. from 2009 to 2012. Was also a Member of the high powered MoU Task Force setup by Department of Public Enterprises, Government of India for six years (2006-2012). Recognizing his global contribution in project management, Government of Turkey released a postal stamp (limited edition) in his honor in November 2010. In short, he is a visionary leader shaping the PM profession globally. Projects are taken up to build the future and are full of uncertainties. Risk is, therefore, at the center stage of managing projects. Risk is associated with all aspects of a project - scope, time, cost, quality, communication, HR, contracts and integration. Risk can also be triggered by political, technical and social environment. Diverse interests of stakeholders contribute significantly to project risks. Few success stories in managing risks will also be covered. We conduct a 30 minute test - Risk Management Knowledge Quotient (RMKQ)TM comprising of 20 questions at the start of the 3rd Module of I/EDPM to assess each participants current knowledge in Risk Management and then compare this with their performance in the 2 hour Certificate in Project Risk Management (CrtPRM) exam after 2 days of extensive training on Advanced Risk Management which extensively covers all areas of Risk management. The improvement seen is phenomenal - on average the knowledge domain of all participants goes up by a factor of 2.7 times. credential. Exam is of 2 hours duration. Taken from Adesh Jain’s concept presented at NASA’s PM Challenge in Orlando, USA February 22-23, 2012 “Awakening of project consciousness through stakeholders buying in”. Every person in the world has a unique E4 - Education, Experience, Emotions and Expectations which impacts their interaction in society and in managing projects. Unique E4 is like a distinct finger print. The challenge for planning and implementing projects, programs and portfolios is to integrate different E4s to supplement each other. This is the kernel of Team Building. Earned Value Management (EVM) provides you with a simple an effective dashboard to measure the “variances” of your project against the project plan. It measures what you have “achieved” against what you had “planned”. It equips you with the much needed tool to monitor and control your project at pre-defined milestones and take corrective actions. EVM checks the “health” of your project periodically and tells you about the early “warning signs”. You might save your project from failure if you take timely actions from the early warning signs. Report on Module 3 : At the end of the module the 3rd report is to be written by participants suggesting changes in their own work environment in view of learning in project risk management and human capital module. Target date for submitting the above report is 10th September 2019 for New Delhi, 17th September 2019 for Mumbai and 23rd September 2019 for Bengaluru. Enunciated by Dr. Eli Goldratt, CCPM brings a new dimension in managing projects. It helps in leveraging Human behavior with aggressive schedules and monitoring through buffers. Implementation of CCPM requires a great deal of trust amongst all the team members cutting across the hierarchy of the management. It requires to develop time estimates based on the most aggressive schedules without any padding kept at activity level. The buffers of individual activities can be clubbed to create a project buffer. The essence of CCPM shall be discussed in the classroom. 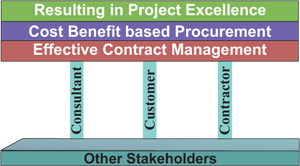 Contract and Procurement management is at the centre stage of project implementation. Well defined strategies must be worked out 3 prior to undertaking of projects to ensure smooth relationship amongst Customers, Consultants and Contractors (C). All of them must be passionately involved in completing the projects. 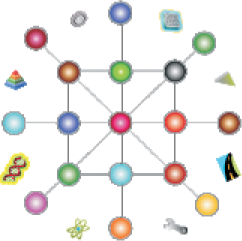 Complex projects involve uncertainties, ambiguities, dynamic interfaces, political and external influences, integration at diverse locations, technology life cycle considerations, managing complex human behavior etc. A simple project could become complex and then out of control resulting into 'Fire Fighting'. An outline of defining complexities and 'how to deal with complexities' shall be discussed in this sub-module. Prof. Homayoun Khamooshi: Ph.D. in Management Science Lancaster University, 1994 is Chair of the internationally known Master of Science in Project Management in George Washington University School of Business. Area of Expertise: Project Planning and Scheduling and Management and Simulation. Prof. Khamooshi of GW School of Business will give a comprehensive Case Study to the students in the first week of August. He will discuss with all the participants (New Delhi and Mumbai) through Video Conference / WebEx. This will be a 30 minutes discussion to review participants understanding of all concepts. It will be followed by 120 minutes case discussion. At the end a 90 minutes presentation on estimation and cost management contracting will be made. The word ‘Project Mindset’ was coined and introduced by Adesh Jain in August 1999 in Stockholm while giving a one day seminar with the same title as this module. In last 16 years, lot of development has taken place in defining ‘Project Mindset’. This session will provide the participants with the latest conceptual framework in managing projects. Do you manage a project where scope is not well defined? Or where customer comes up with new requirements too often? May be Customers or end users are not sure what they want…. Agile is all about adapting to change. It was buit on the founding principle that business drivers will change and the project teams must be ready to adapt. Agile practices are about focusing on delivering the best thing possible in a set time period. Agile is about doing as opposed to being paralyzed by over-planning. In agile you get the minimal necessary requirements and start working. We discuss the complex case studies as to the application of best practices in managing projects and programs. The leaders who have managed complexity with a great track record, will share their thoughts in this one day program. This is a most beneficial day as it covers all the knowledge gained to its application in real life by understanding the competencies. demonstrated by successful leaders. Is must and should be written by participants suggesting changes in their own work environment in view of learning in advanced management concepts project, case studies, strategic project management and project mindset. For all participants: 10th October 2019.